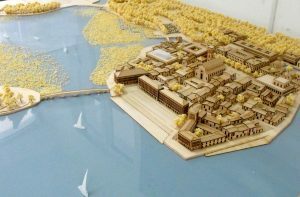 Dongli Lake, an artificial lake with 2 km² water surface and 21 km of shore line, is located on the central development axis of Tianjin, between the central city and the coastal new areas. South of the lake is the major economic development belt; to its north lies an important environmental conservation area. The area is counted among those with the highest development potentials of Tianjin City. 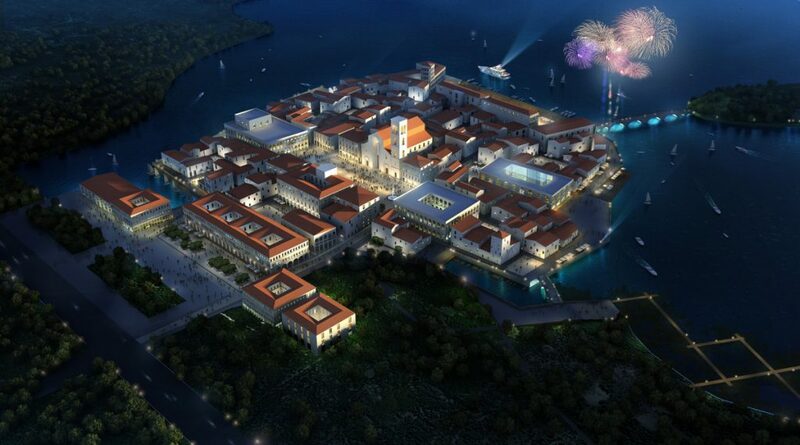 The plot itself – a peninsula – is located in a privileged part of Dongli Lake, close to the conference island and the art gallery district. 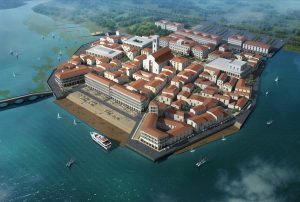 Dongli Lake Tourism Development Co., Ltd.
Continue reading "Dongli Lake European Town"
Overlooking the Mediterranean Sea, in countries like Spain, Italy and Greece, a number of beautiful ancient ‘white villages’ can be found. 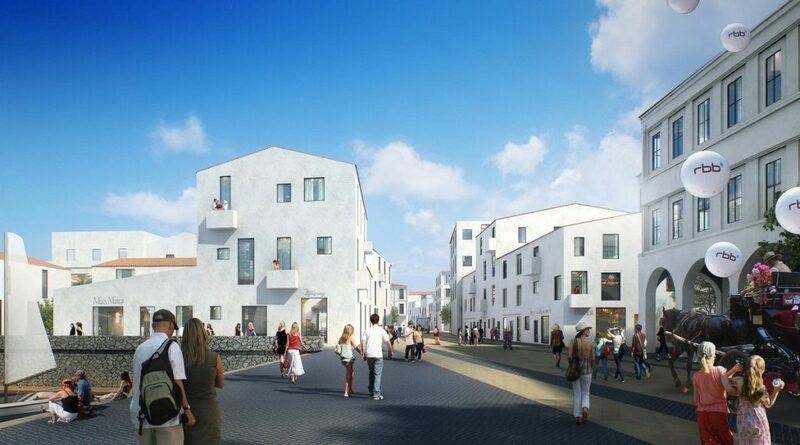 The vernacular design of these villages forms a unique ecological and sustainable environment. They are spectacular places which express the traditional life in Europe and provide a sense of relaxation, enjoyment and romance.The intention of this project is to become an alternative for the so-called ‘European style’ spread all over China creating a very unilateral image of Europe. It also tries to avoid the mistakes of unbalanced developments which end up in greatly artificial environments with cheap and unsteady character. After intensive research in order to understand the key features that make the ‘white villages’ so special, it became evident that it is not sufficient to stay on the surface and just copy the architecture (facades), if one wants to capture the essence and atmosphere of these villages. 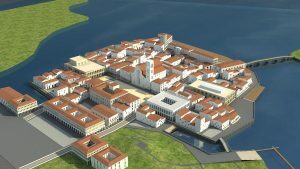 A design method was developed that follows the organic planning, the pattern of narrow streets and squares of differing size, the scale, shapes and volumes of the buildings (traditionally painted in white) which altogether create this unique and vivid environment. 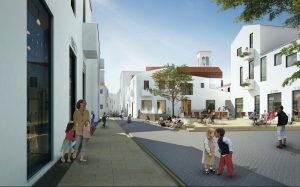 Inspired by the architecture and urban planning of the traditional ‘white villages’, RhineScheme’s design incorporates winding streets, public and intimate plazas, charming white houses, varied windows and balconies, beautiful courtyards, lakeshore promenades, native vegetation, as well as an attractive mix of recreational, commercial, civic, leisure, retail and residential functions scattered across the master plan, all of which provide the intended casual, humane and lively atmosphere. The design provides the highest quality of living, working and recreational environment. 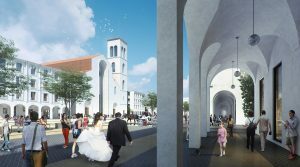 It emphasizes the difference between the busy urban character of the small town and the natural and quiet appearance of the adjacent ‘Wedding Park’. 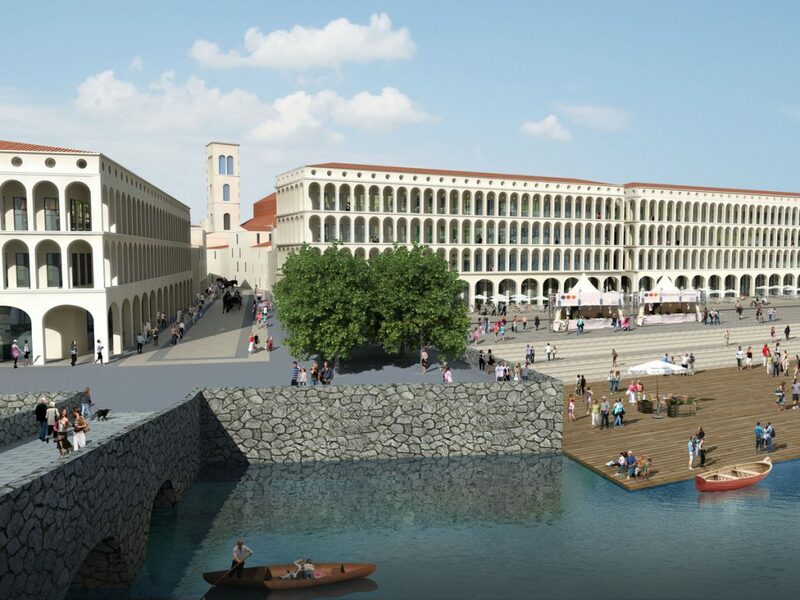 Sensitively planned open spaces and water features will enhance the quality of the alleys and streets; the elimination of cars and trucks ensures that the town is pedestrian-friendly and so becomes a pleasant and convenient place to visit, live and work. A car-free environment not only makes the air cleaner, but also allows buildings to be closer together, providing more shade while allowing maximum natural light. 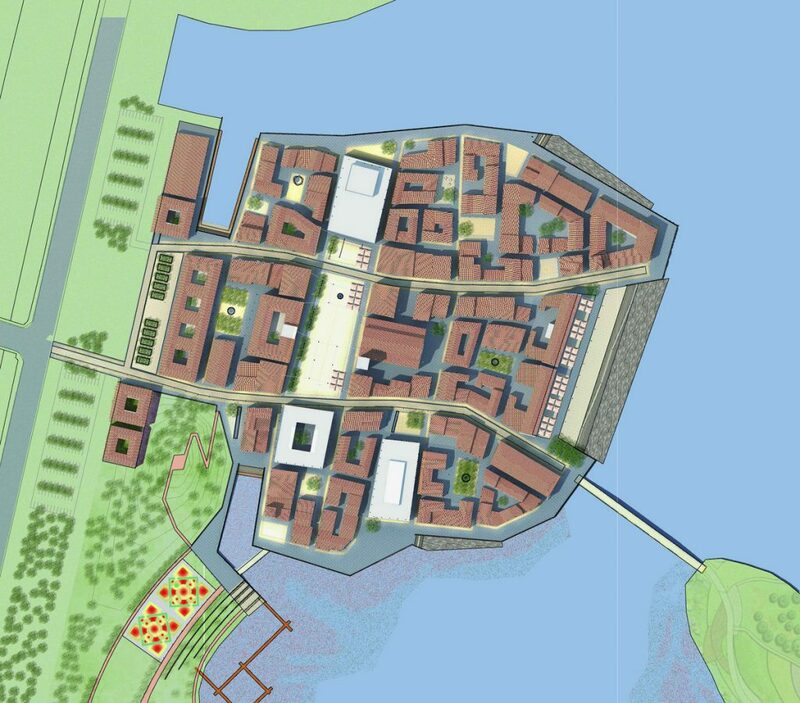 RhineScheme’s proposal seeks great visual quality by adapting a simple and economic structure. The most useful way to do this is locating buildings in a flexible way, using a regular geometric constant that can be adapted to the different needs and uses. The Entrance Plaza is a welcoming square which opens to the main access road and parking area, serving as information and gathering point for visitors. The Main Plaza is at the center of the town. 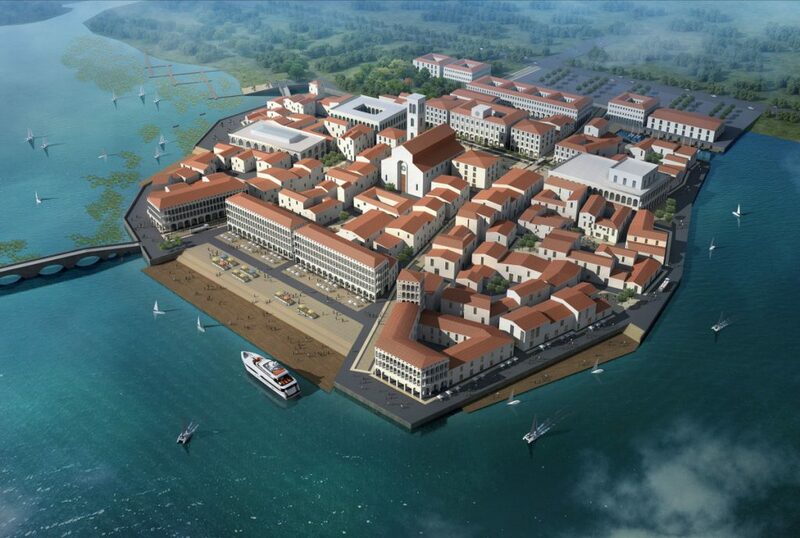 It is surrounded by the most important and representative buildings (theatre, church, museum, roman baths). As it happens in many European towns, it is the public space where festivals, special markets, wedding celebrations, night-life and important events take place. The Main Plaza is the heart of the town. By contrast, the Water Plaza is in direct contact with the lake thanks to a wooden pier which provides space for many different activities and beautiful views of Dongli Lake. It is a leisure-orientated plaza where people may enjoy outdoor restaurants, bars and coffee shops and different aquatic activities. 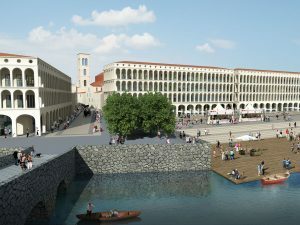 These three plazas are connected through two main streets, hosting a large number of galleries, fashion and arts-and-crafts shops. 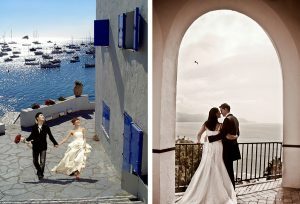 The stone-paved streets which casually change direction provide an easy walk and a peaceful and satisfying promenade. 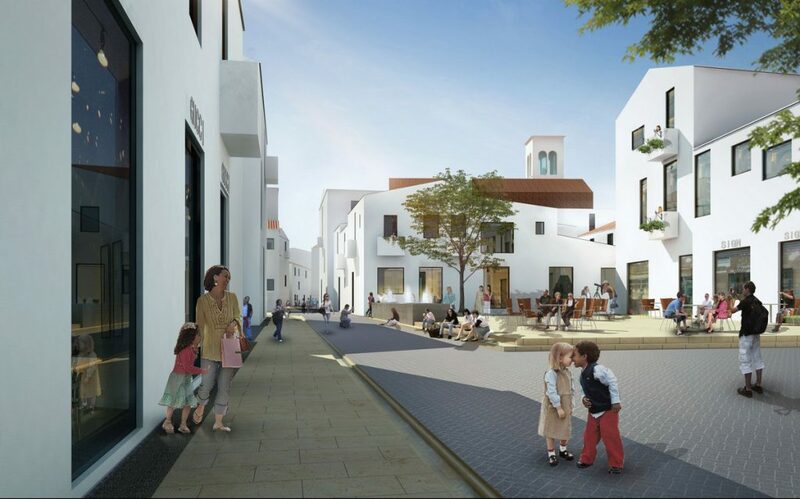 Besides the main streets and plazas organizing and structuring the urban body, a white labyrinth of alleys, courtyards and small plazas has been designed that make up the rest of the town in an intentionally heterogeneous way, generating a variety of different spaces. Building plots are organized by assigning different typologies of buildings, so that streets have distinct characters and atmospheres. The curvy narrow streets are perfect for exploration. Visitors will enjoy discovering beautiful tiny plazas, intimate patios, hidden cafés, and feel like taken to a different time and place. 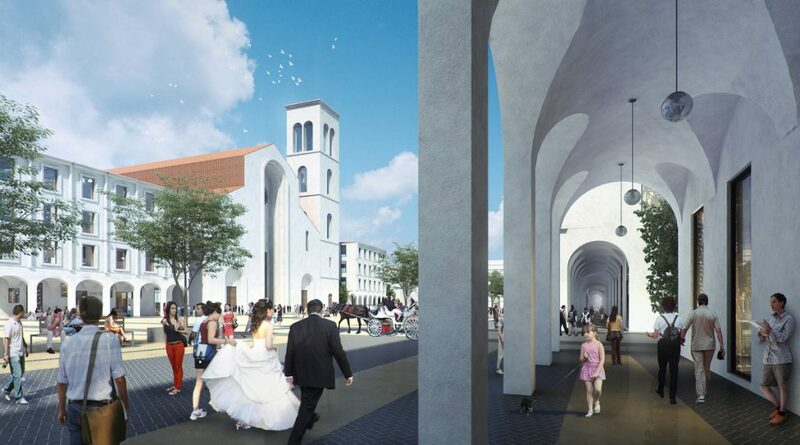 All the proposed architecture – although inspired by traditional Mediterranean architecture – is original and specifically designed to meet its purpose and functions. 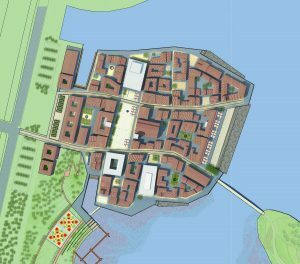 The arrangement of the urban structure is a direct result of the business development strategy: An elaborate business concept has been drawn up that aims at generating a lively city working 24 hours a day during 365 days per year. If the planned hotels, shops, creative industries, offices and agencies, SPA and wellness facilities, restaurants, bars, cinemas and theatres want to run successfully, they need to be part of an overall and attractive tourism concept. To this intent, different activities and events throughout the year are planned to keep the business flourishing: in spring an Easter Market, Valentine’s Day festival, carnival activities; in summer Water Theatre and music festival, Mediterranean food markets, Spanish bull-riding; in autumn a Bavarian-style October Beer festival, grape harvest celebration, and an autumn market, and in winter ice-skating, traditional Christmas Market, and European New Year. 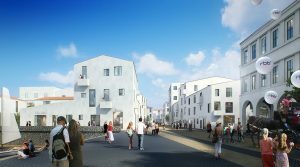 This business strategy – combined with the architecture and urban structure, landscape and lighting concept – will eventually create an atmosphere and character like in a typical European small town.